Located in the Village of Wind Point in Racine County, Wisconsin, the Wind Point Lighthouse stands 108 feet tall and is listed on the National Register of Historic Places. The lighthouse was built in 1880 and was designed by Orlando Metcalfe Poe who had served in the Civil War as a Brigadier General. It was lit for the first time on November 15, 1880 and continues to be lit to this day. The lighthouse and park grounds were transferred from the U.S. Coast Guard to the Village of Wind Point in 1997. The lighthouse caretakers reside in the keeper's quarters and help maintain the park grounds which are open to the public daily. The lighthouse tower is open for public tours on certain dates during the year. The hall and south lawn of the grounds are available to rent for weddings and special events. The hall is also used as the official meeting location for the Wind Point Village Board on the second Thursday of each month. 1870-1877 - Recommendations were made annually requesting that a lighthouse be built on Racine Point, which lies 3 ½ miles to the north of Racine and 18 miles south of the light on the pier at Milwaukee. Requests pointed to the frequent shipwrecks in the area because of lack of directional light. 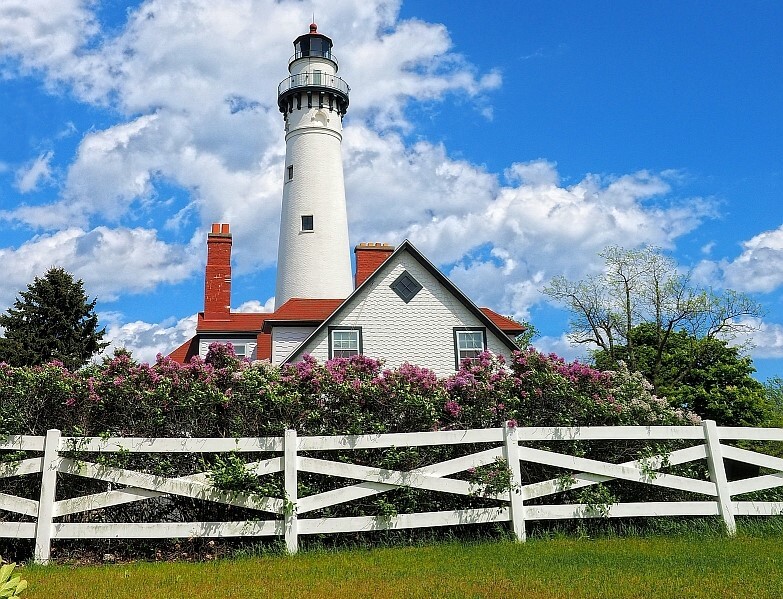 1878 - Congress appropriated $40,000 for building a lake coast light and fog-signal at Racine Point for the U.S. Lighthouse Service (which later became the U.S. Coast Guard). 1879 - The site was selected for the station and the title papers were signed and sent to the Department of Justice for approval. Plans were also submitted in preparation for approval by the Dept. of Justice. The lighthouse and attached building were designed by Orlando Metcalfe Poe. The tower would be 108 feet tall, with 144 cast iron steps. 1880 - The dwelling was erected, plastered, painted, and the windows hung. Work began on the lighthouse tower, and one fog signal was set up. Wells were also dug. Illumination began on November 15, 1880 using a kerosene “Aladdin’s” lamp and a third-order Fresnel lens. A keeper and his family maintained the light, living in residence on the property. They also manned a life-saving station, through use of a boat ramp. 1899 - The keeper’s dwelling was remodeled and extended, adding two additional apartments to the building, which allowed the staff to increase to three keepers. The barn was moved, and a new concrete walk was built. 1900 - Building began for a new fog signal building. The new signal was steam powered and could be heard 40 miles away. 1902 - The siren was replaced; the former fog signal building was removed to the south-western part of the property and converted into a woodshed. 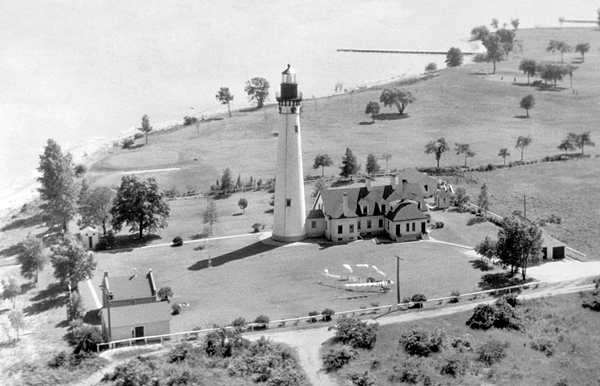 1924 - Wind Point’s lighthouse became the second of all Great Lakes' lights to be electrified. The new lens was a DCB Series Aerobeacon. 1964 - The U.S. Coast Guard replaced the lens with a fully automated system and dismantled the foghorn, which was no longer needed. At that time, the Coast Guard sealed the tower from visitors and no longer staffed the site. At this point, the Village of Wind Point began leasing and maintaining the property. 1980 - The Lighthouse was added to the National Register of Historic Places. The Village also purchased adjacent property to help preserve the grounds, as the Village built up around it. 1984 - The Tower was reopened as part of the 150th anniversary for the City of Racine and tours were started in 1989. Over 1000 people waited in line to tour the tower on its first day open. 1997 - The Coast Guard transferred ownership to the Village of Wind Point, with the requirement that it be maintained as a historic landmark. Initially, one member of the Coast Guard lived in the lighthouse keepers quarters with his family. When the quarters were remodeled in 1899, they created two additional living quarters, which allowed three families to live on the premises to share the responsibility of keeping the light on. In 1964, the Coast Guard automated the light, so staff was no longer needed. At this point, the Village of Wind Point took responsibility for the care and maintenance of the lighthouse and grounds, so a new family was hired to care for the property and reside in the quarters. Today, Joseph and Mary Ann Huser serve as caretakers of the lighthouse grounds. A list of Coast Guard keepers can be found here. For an inside peek of the caretakers quarters, check out this article from the Milwaukee Journal Sentinel. The Lighthouse was built in 1880 and was designed by Orlando Metcalfe Poe who had served in the Civil War as a Brigadier General. After the war, he served as engineer secretary of the Lighthouse Board and was in charge of lighthouse construction. It was lit for the first time on November 15, 1880. 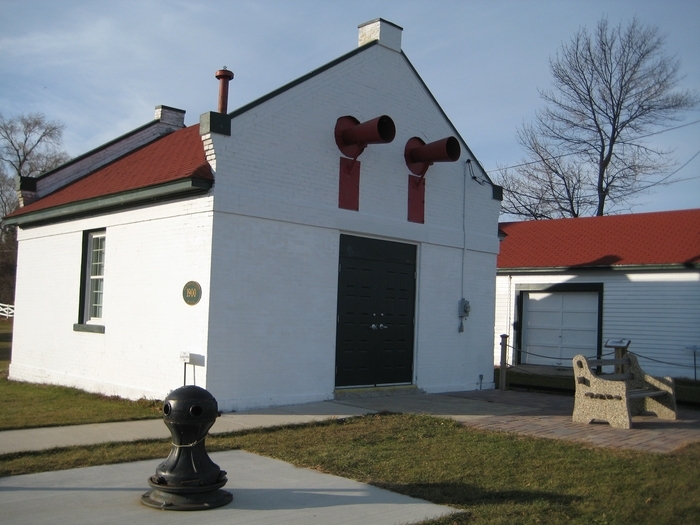 The Fog Horn Building shows the original design with the huge fog horns aimed toward the Lake. The fog signals could be heard 10 miles out into Lake Michigan. 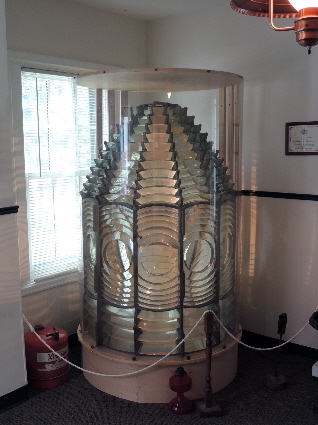 The Fresnel Lens created the distinctive flashing light using dozens of glass prisms to bend and focus the light which made for an immensely powerful light. The original lens is on loan from the Racine Heritage Museum and can be seen in the old Coast Guard Keepers Quarters, which now serves as the Village Hall. A mechanism of weights, cables and pulleys rotated the enormous Fresnel Lens to create the flashing that navigators on the Lake recognized. Fuel for the light had to be carried up the 144 iron steps and the Keeper or his Assistants had to make that climb daily. About 270 gallons were used in 1881. The Keeper or his Assistants had to clean the Lens every day so that it sparkled. There were 7 Head Keepers and more than 30 Assistant Keepers of the Wind Point Lighthouse from 1880 – 1964 when the light was automated. In 1997, the U.S. Coast Guard transferred the Lighthouse to the Village of Wind Point, requiring the Village to maintain it as a historic site and landmark, but kept the responsibility of the light itself. 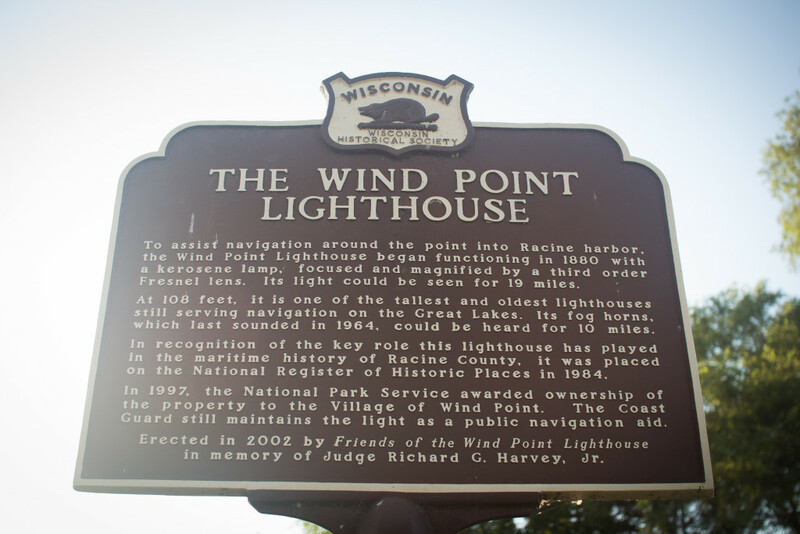 The Village of Wind Point is responsible for the care of the Lighthouse and the grounds surrounding it. Aerial view of the lighthouse in 1947.